I met Stu Heinecke though an envelope that I received in the mail about 30 years ago. Printed on the envelope was a cartoon of two distinguished looking gentlemen. The caption said, “Have you seen the latest Journal? It’s all Mark Smith this and Mark Smith that… and nothing about us.” Of course I opened the envelope. That envelope and cartoon;was Stu’s creation. Fast forward 30 years to today and Stu and I enjoy sharing ideas and stories. I always enjoy my conversations with Stu, he’s thoughtful, intelligent, brilliant, creative, and humble. A long-time cartoonist, no doubt you’ve seen his work in the Wall Street Journal amongst other places. Stu recently published a book that I hold up in many of my speaking events… yes it’s that good… titled “How to Get A Meeting with Anyone” and he means it! Stu can work with you to get a meeting with darn near anyone you want. Mark S A Smith: That’s right. A long time cartoonist, no doubt, you’ve seen his work in The Wall Street Journal amongst other places. Stu recently published a book that I hold up in many of my speaking events. Yes it’s that good, titled, How To Get A Meeting With Anyone and he means it. Stu can work with you to get a meeting with darn near anyone that you want. 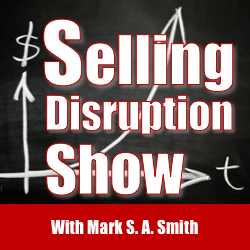 Welcome Stu to The Selling Disruption Show. Stu Heinecke: Hey, wonderful to be here. Mark S A Smith: Thank you. How can you get a meeting with anyone? Stu Heinecke: Man, there’s so many ways to do it, but I’ll just start by telling you how I’ve done it. Mark S A Smith: All right. Stu Heinecke: I’ve used my cartoons my whole career to break through it. You know, the piece you were talking about, can I set the scene a little bit further? 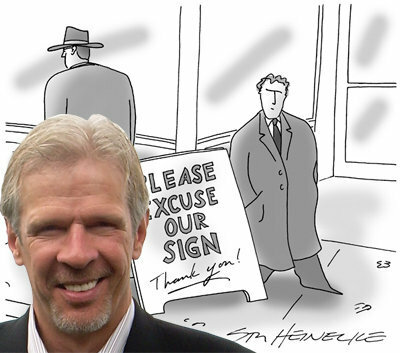 Stu Heinecke: It was actually two executives and they’re in a corner office. Stu Heinecke: You could see the buildings out the window and all that. It’s a New Yorker style cartoon. One of them is just pissed and he’s got the newspaper splayed out on his desk and he says to the other one, have you seen the latest issue of The Journal? It’s all Mark Smith this, Mark Smith that, and nothing about us. He’s angry about your success. It’s made everybody who got these things really happy, because they’re just picturing that with one of their competitors and look at how they’re just confounding them with their success which is really cool. Well, that really is a key to disrupting people because here’s the thing. When I use cartoons, and mind you, cartoon, I just want to make sure I underline this. They’re not the only way to break through. I’m not saying that, but they’re my way and it’s what launched me into writing the book eventually and discovering really this whole hidden form of marketing that I called contact marketing in the book. Here’s the thing about cartoons. When magazines and newspapers run editorial readership surveys, what they find Mark is that the cartoons are almost always the best read and remembered part of anything they’re in editorially, and if you think about that for a second that’s amazing, because these are collective works. Everything that’s in there is created by some of the best creative minds in the country. All the articles, all the ads, everything is supposed to get your attention and be memorable. Stu Heinecke: All of this, these little stories distilled down to a few lines and a couple lines of text are what stick, what gets people to, in the case of The New Yorker it’s what gets them to open the magazine even. So, they’re amazing. Mark S A Smith: What’s even more powerful is that The New Yorker runs collections of their cartoons on a regular basis that you can pick up on the news stand which sell for three times more than the average magazine that they sell. Obviously there’s something going on here. Stu Heinecke: Yeah, well my friend, Bob Mankoff, the cartoon editor at the magazine said, in a recent survey, that they found that 98% of their readers read the magazine. Actually I guess what they do is they read the cartoons first and the other two percent is the best part, were lying. Mark S A Smith: I love it. So, what that means is we can disrupt by using things such as cartoons because they are top of mind and we’ve illustrated that they are the most read thing in one of the most popular magazines in the United States. Now, one of the things I think is really interesting that I want to rewind back to that you pointed out that in your cartoon that got my attention, was I was the hero. Mark S A Smith: That is one of the secrets to being disruptive. Don’t make the product the hero. Make the customer the hero. Mark S A Smith: Yet, so many people make the product the hero. Stu Heinecke: Thank about it. If you’re familiar with Miller beer and their slogan, It’s Miller Time. Stu Heinecke: If you got a poster that said, and it’s a big poster, that says, it’s Miller Time, Mark, what would you do with it? You’d throw it away. Stu Heinecke: It’s junk. It’s about them. It has nothing to do with you. If you send a cartoon that resonates with people, so, another aspect of cartoons that it’s cartoons, really any form of humor is about truth being revealed with a twist. Mark S A Smith: Isn’t that the truth? Stu Heinecke: It is exactly the truth. That’s what I was going to say. That’s why we find ourselves, when we’re laugh about things we say, gosh, that’s so true. I’ve been through something like that or I know someone like that. There’s always some point of agreement that is delivered, I would say subliminally in a cartoon. If you see the cartoon and you go, that’s cool, you already got it. Stu Heinecke: You already got the message. So, craft the message and plant it carefully and certainly that doesn’t mean putting your logo on the buildings that shows through the window in the background, you know, or some chaztky on the desk. It has to be about the recipient. Mark S A Smith: Yeah, that’s right. Stu Heinecke: You’re right. It has to be about the recipient and it has to be something that they feel is true about themselves. Mark S A Smith: That brings up an interesting concept which is how do you plant ideas around disruptive products and services in somebody’s mind? How do you create inception? Stu Heinecke: Well, I mean again, I’m sorry to relate it to cartoons this whole time. Mark S A Smith: Why not? It works. Stu Heinecke: Yeah, so, the cartoon that you got, by the way, do you remember? I wonder if you remember The Mailer. Mark S A Smith: I remember The Mailer but I don’t remember the contents. It was 30 years ago. Stu Heinecke: It was a long time ago. I’m just, I’m honored that you remembered the cartoon and me, so that’s great. Mark S A Smith: Remember, I used to hold that up in The Guerrilla Selling seminars that I did. Stu Heinecke: Yeah, that’s right. That’s how I knew Jay. Mark S A Smith: That’s right. Exactly. Jay Levinson. Yeah. Marketing Jay, yeah. Stu Heinecke: In that cartoon you can immediately see these are your competitors. You’re like a fly on the wall in this scene and they’ve got the newspaper out and this senior guy is really jealous, like, really envious I guess and just pissed that you got in The Journal and he didn’t. What a great opening for this mailing. This mailing was a subscription offer for Sales and Marketing Management Magazine. Stu Heinecke: You know what we said in the copy, that’s the thing. The cartoons then allow you to then amplify whatever theme or thought was released in the cartoon. So, what’s released in the cartoon is that you’re a pretty successful guy, Mark. We know it and if you want to continue that, if you want to enhance that, you need to be seeing what we’re bringing to our readers every month. I think it was monthly. You need what we’re bringing out. This really fits you. You belong here. I mean, the cartoon’s got them going, yeah, yeah, that’s right. Not only that, but with your paid subscription we’re going to send you a free eight by ten suitable for framing print of that cartoon so you can frame it and hang it up in your office and then everyone can know how successful you are, if they don’t know already. They’ll know how successful you are. All of this really did disrupt your day but it was a positive disruption and it wasn’t like, hey, we got some horrible news for you. Maybe that works. I don’t know. Just, that’s not my focus but certainly this one interrupts your day in the most delightful way and you can say just about anything in a cartoon and they’ve got a positive response. It melts the ice. Would an example make sense here? Mark S A Smith: Absolutely. Yeah. Give me an example of what you’re doing. I know you’ve got some large corporate clients that you’re working with. If there’s anything that you can talk about, ooh, I’m all ears. Stu Heinecke: Yeah, I can’t say who they are but I can just talk in generalities of what’s happening. Mark S A Smith: Let me frame this up first of all. It’s not only are you a cartoonist but you also have a marketing agency where you work with organizations to help put together campaigns that blow down doors of top officers. Mark S A Smith: You really focus on how do you get to whales in corporate organization. Stu Heinecke: Yeah. I discovered really early and really quickly in my career that, if i sent a cartoon, let’s say a print of a cartoon to someone with a note and you know, basically it’s a lot like the direct mail pieces I was producing but these were something different. They were contact campaigns. I didn’t really know what to call them, but I called them contact campaigns. If I sent this to someone and said, I just want to talk with you, because I think maybe we can do something around this, that, or the other, whatever, or maybe around the cartoon and people would call back. They would respond very very positively. Actually, when I first did this I ended up launching my business with my first contact campaign to about two dozen circulation directors at the big publishing houses in Manhattan. This really typifies a contact marketing campaign. I spent less than a hundred dollars on it. I only reached to two dozen people but they critically important to me, and I launched my career with that. That launched my business. I got a hundred percent response rate. Not only that, all of them met with me and all of them became clients. Mark S A Smith: That’s disruption. Stu Heinecke: That’s contact marketing. Mark S A Smith: Yeah, I love it. Absolutely love it. So, contact marketing, target marketing, is what I consider to be number two of the three ways you get more customers fast, and that’s one of the reasons why I hold up your book in my speeches because I say, this is the book that tells you step by step how to do that. I’ve got videos of that, Stu. We can go through and clip out that segment. Then you can use that on your website. Stu Heinecke: I would love to do that. You’re on. Mark S A Smith: All right. I love it. Share with us some of the things that you’re doing with some of your clients without revealing too many of the insider secrets. Or tell us all you want. Stu Heinecke: You know, when I discovered really early in my career that cartoons would get me through to all these important people, then I thought, well, I could get through to just about anybody. I started pushing the limits. How far can I go? I reached presidents, one prime minister, celebrities, and really countless CEOs, senior level executives and top decision makers which was really the most useful part of all that. You end up discovering that you can connect with just about anyone. Maybe the more challenging thing is, take what I’m doing and transfer it to others to see if we can get the same mileage for them. What we discovered is, yes we can. We’ve got a whole contact marketing system that we use for our clients and generally these are Fortune 1000 clients. I’m excited about them because they’ve got bigger sales teams to work with and if you move the needle for them, man, it means a lot of dollars. You can just come up with just some amazing metrics from all this. Stu Heinecke: Well, one of our clients told me that they were not getting through to most of their assigned accounts. A lot of companies are involved in account based marketing and selling. Mark S A Smith: Absolutely. A lot of competition to get that attention. Mark S A Smith: Zero. Stu Heinecke: Yeah. Then, they told me, this has gone up to about a 75% contact rate and a 50% meeting rate. Mark S A Smith: That’s extraordinary. Over the top. Stu Heinecke: That’s from the cartoons. You know, a lot of times people say, that’s fine Stu, but I’m not a cartoonist. Mark S A Smith: Well, you don’t have to be. Stu Heinecke: You don’t need to be. Stu Heinecke: Yeah, you don’t have to be. Now, but again, I keep saying it. It has nothing, really doesn’t have to have anything to do with cartoons or me, creating campaigns for you. It’s just, you’ve got to be audacious and you’ve got to use your imagination and let your mind go wild. One guy spent 10,000 dollars to reach Larry Ellison and the story was, he owned a small advertising agency in the Bay Area and one of his clients, the owner of a tech company, approached him one day and he said, you know what, I want to get in front of Larry Ellison because I have a feeling that he’s going to want to buy my business. The only thing is, I have no idea how to get in front of him, and in case anybody in the audience is wondering who Larry Ellison, he’s the CEO of Oracle. I know he’s the guy with the big catamaran. I guess they’ve won the America’s Cup? Mark S A Smith: Yes, he’s won the America’s Cup a few times. He likes to fly big airplanes. Yeah, right. Stu Heinecke: Yeah, he owns the island of Lanai. Mark S A Smith: Yeah, Larry is very rich. Stu Heinecke: Yeah, very. One of the most wealthy people in the world and he’s not going to be one of the most easiest ones to get a hold on. Mark S A Smith: He’s very well protected. Stu Heinecke: He is. Now, here’s what my friend, Rick Bennett came up with. He said, you know, no problem. I know how we’ll get in front of him, and what they did was they produced a contact letter just to Larry and they produced it as a full page ad and they ran it in The Wall Street Journal. Mark S A Smith: Yeah, an open letter to Larry. So good. Stu Heinecke: Isn’t that amazing? Mark S A Smith: Everybody’s calling him up, saying Larry, have you seen the letter to you? Stu Heinecke: Exactly. It wasn’t just that Larry saw it. Larry probably didn’t even care, seeing it in The Wall Street Journal. I’m sure he reads The Journal. That wasn’t the genius of it. The genius was exactly what you just pointed to. All of the people who had ready access to him. They saw it too and they were calling him all day long. So, this little campaign enlisted the help of all of the people who knew Larry really well and read the paper that day and they called him all day long. The meeting took place, the company was sold to him for 350 million dollars. If you divide that out, 1,000 dollars to run the ad against a 350 million dollar deal, that’s a three and a half million percent ROI. Mark S A Smith: Yeah, well, we can do that. Stu Heinecke: Isn’t that crazy? Mark S A Smith: The return on investment of this disruptive approach to selling is extraordinary and some of the key aspects of this really are create something that is about the customer, that grabs their attention, and says, you know, we are out of the box. We know about you and we want to talk to you to share with you what we’ve learned. I love that approach. That’s really what contact marketing is all about. Stu Heinecke: It is. It’s opening the door so you can have those kinds of conversations and certainly, one at my new great friends is Eric Quanstrom, the CMO of KiteDesk. I interviewed him on Contact Marketing Radio, which is the show I host every week. Mark S A Smith: You’ve had me as a guest on it as well. Mark S A Smith: I highly recommend that show for more of what we’re talking about today. So, we’ll get that link to the show notes here. Stu Heinecke: Yeah, lots of discovery going on there and I ask every guest on the show, when you absolutely must break through to someone of great importance, someone who’s nearly impossible to reach, how are you doing it? It’s the wildest thing what people share when it’s on the show. What Eric said to me was, if he starts out or let’s say if someone’s approaching him. He’s a CMO after all. He’s one of the seasuite guys and he said, you know, when someone starts out a sentence by saying, I noticed that, I noticed something about you, what a great way to start out the conversation. What contact marketing does is it gives you the opportunity to open the door, pry it open, and say that, I noticed that, I don’t know, there might be some trigger event that you’re going to reference, or I notice that you’re a fan of USC. I went to USC too. Anything. You get a chance to create that, just the opening of a relationship and of a dialogue that can help the person you’re reaching reach one of their goals and that’s how sales happen. Mark S A Smith: That’s right. The way that we frame that up on Selling Disruption is repetitive relevance. If it’s not relevant we aren’t even getting to them and we can bust through using the contact marketing of showing them how relevant we really are alone. I love it. Love it, love it. Stu Heinecke: You know, there’s one other thing that’s really terrific about contact marketing which is that, you now, of course we’re going to open the door and we’re going to open the door to that, I noticed that, leading line into a dialogue which leads into a relationship but you know, the thing that contact marketing seems to add to the mix constantly is that the people on the receiving end of this, if it’s done well, if it’s done right, they’re saying, I love the way this person thinks. Mark S A Smith: Right. It’s impressive. Stu Heinecke: If people are saying that about you when you’re trying to reach them, how much better can it be? Mark S A Smith: When it comes to a competitive race, the winner is the one that creates the connection, the clarity, and confidence, first. It’s not about a better product. it’s just better for that customer and it’s usually a large mix of value propositions that make it happen. 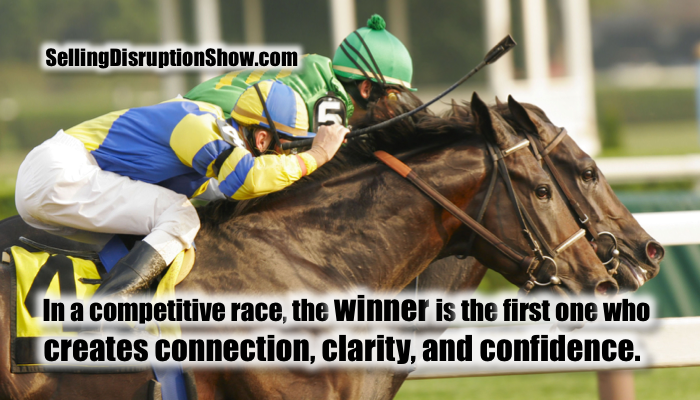 So, by creating that connection quickly using contact marketing we can disrupt the market, truly have selling disruption. Mark S A Smith: I love it. I love it. I always enjoy having conversations with you Stu. You’re brilliant, out of the box, in a true sense, although all your cartoons are in a box. Stu Heinecke: I really appreciate that. Thank you so much, Mark. Mark S A Smith: Thank you. Do you have something you’d like to offer to our listener? What should they do next? Stu Heinecke: A couple things. One is I would encourage you to buy the book. It’s How To Get A Meeting With Anyone and you can buy it anywhere books are sold other than the airport. Currently. I’m not there yet, but it’s on Amazon, Barnes and Noble, Books-A-Million, Indigo, book stores literally all over the world. I’m hearing from people all over the world who are saying, hey Stu, I’m using contact marketing. It’s working. I think you’re going to find that really interesting. Mark S A Smith: It’s a hell of a deal. It’s less than 20 dollars in Amazon. Just get it. Stu Heinecke: The stuff that’s in there, the stuff that people shared with me about how they break through is just amazing. It’s only like a little tiny part about cartoons. Mark S A Smith: It’s a cookbook? A cookbook on how to do it? Stu Heinecke: Don’t expect cartoons. That’s not really what it’s about, but it is about breaking through. So, the other thing is, we’ve just completed a new training program with NASP or the National Association of Sales Professionals called The Power of Contact Marketing. Now, I just recorded the videos and I co-created it with them but I didn’t create the whole thing, so, they put it together using their technology and it was beautiful. It just keeps you on track. It holds you accountable for your results of how you’re spending your day but in this case, it’s how you’re spending your day opening new connections that are critical to your success. Mark S A Smith: Beautiful. Stu Heinecke: So, that’s called The Power of Contact Marketing and it’s on nasp.com. Stu Heinecke: Well, I run an agency and I guess if you’re in the Fortune 1000 you’ll probably hear from me. One other thing. You can follow me on Tweeter at @bystuheinecke. So, that’s B-Y-S-T-U-H-E-I-N-E-C-K-E .com. Stu Heinecke: You might also try, also have a free look at my author site which is stuheinecke.com. So, again, S-T-U-H-E-I-N-E-C-K-E .com. Mark S A Smith: Yeah, I like to tell people that you’re Stu Heinecke and minus the N.
Stu Heinecke: It is. That’s close. So close.